This analysis is based on the “Self-Sufficiency Standard,” a realistic, geographically specific, and family composition-specific measure of income adequacy determined for more than 700 family types in each of the boroughs, and thus a more accurate alternative to the official poverty measure. The standard includes the full costs of basic needs for working families, including housing, food, health care, child care, transportation, payroll taxes and tax credits, and other miscellaneous expenses. Families struggling to make ends meet live in every neighborhood in New York City. 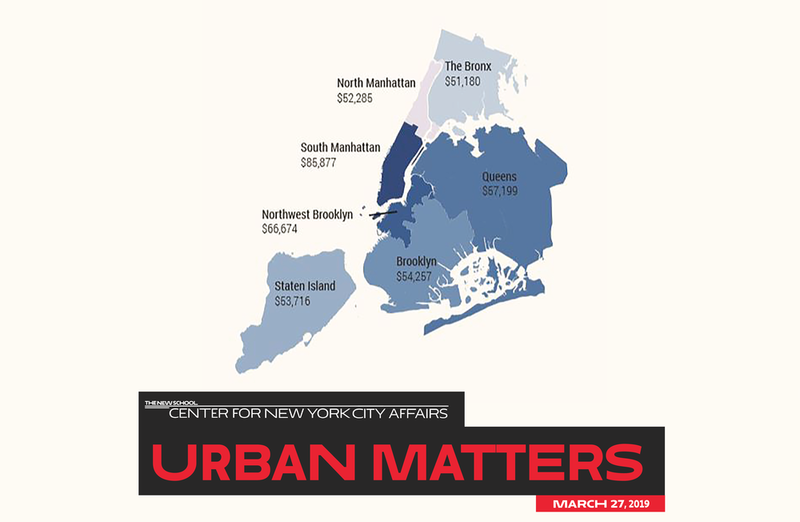 This nuanced measure reflects the higher costs facing some families and the geographic diversity of costs among boroughs. For example, the monthly costs for one adult with one school-age child in the Bronx is $4,265, requiring a minimum annual income of about $51,000 for the family to meet the standard. That would require an hourly wage of $24.23. Yet 71 percent of households in the Bronx with at least one child have incomes below the Self-Sufficiency Standard. The report’s findings are divided into six briefs that explore how costs and income inadequacy are changing, which groups bear disproportionate burdens of inadequate income (such as by race, gender, and family composition), and what roles education and employment play in combating income adequacy. Authored by Dr. Diana Pearce at the Center for Women’s Welfare at the University of Washington, the series of briefs is the fifth update in New York City since 2000. The costs of basic needs rose at nearly three times the rate of wages between 2000 and 2018, leaving more families with the difficult decision of paying for rent versus food, childcare or healthcare, lights or heat. For families with young children, the costs of housing and child care combined typically make up half of their budgets. It is typically low wage rates, not lack of work effort, that result in inadequate income. Eighty-four percent of households below the Self-Sufficiency Standard have at least one working adult, and two-thirds of these have at least one full-time year-round worker. The wages of those above the standard (an average of $33.52 per hour) are more than double the wages of those below the standard (an average of $12.89 per hour). People of color disproportionately lack adequate income, particularly Latinx households. Overall, the rates of income inadequacy for every race/ethnic group of color are double or more the rate for Whites, which is 24 percent. While increased education lowers income inadequacy rates, at each educational level income inadequacy rates are still higher for people of color. Women and people of color must have considerably more education than men or their White counterparts to achieve the same levels of self-sufficiency. Forty percent of working households have incomes below the Self-Sufficiency Standard, while only 14 percent fall below official poverty thresholds. Many individuals find they earn too much to qualify for most supports yet are still struggling to make ends meet. Single mothers of color face the highest rates of income inadequacy and higher educational achievement does not make a significant difference. However, there is encouraging news. New York City and State have made several strides to bridge the deep economic divide, including providing family leave to workers, reducing MTA transit fares for low-income New Yorkers, instituting free universal school lunch, and the City’s re-commitment to access to health care, regardless of income or immigration status. In 2014, New York City also undertook a dramatic expansion of full-day universal pre-kindergarten. As the report estimates, the City’s Pre-K for All program reduces child care costs by about one-half, lifting about 3,500 families above the Self-Sufficiency Standard. In 2019 all New York City workers will be covered by a $15 minimum wage; the incremental increases to this new minimum have made a powerful difference. Yet even an hourly wage of $15 does not constitute a self-sufficient wage for most New York City households, and some workers are left out of these increases. Benefits from these policy changes have reached many workers and their families, but the incomes of millions of New Yorkers still fall short. Increase wages to align with the true cost of living, address the wage gap for women and people of color, and fund targeted workforce development training programs. Strengthen current eviction and homelessness prevention supports, renew rent regulation laws, and invest in public housing. Increase access to—and quality of—affordable child care and implement strategies to support child care access for families that work non-traditional hours. Lower food costs and increase access to affordable healthy food options. Expand access to healthcare for uninsured New Yorkers including immigrant and undocumented residents. By better understanding the characteristics of households who struggle to make ends meet, policymakers, service providers, employers, philanthropists, and others can work together to design solutions to move more families along the pathway to self-sufficiency. To further explore the report’s key findings, we are hosting a cross-sector convening on April 10, 2019. The goal of this “Self-Sufficiency Summit” will be to identify opportunities for collective action and ways that policymakers, service providers, employers, philanthropists, and others can develop solutions for our communities and work towards solutions together. We invite you to join us; you can RSVP here. Sheena Wright is President and CEO of United Way of New York City. Merble Reagon is Executive Director of the Women’s Center for Education and Career Advancement. The Overlooked and Undercounted 2019 ﬁndings are explored through a series of research briefs, interactive maps, and a data ﬁle of tables by borough that can be explored online here.